[SatNews] It's not nice to interfere. Newtec has today given its support for the standardization and adoption of industry-wide counter-measures to combat interference. 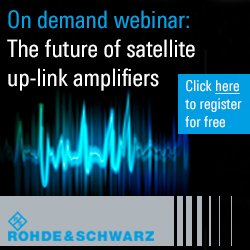 Interference of satellite carriers is a growing problem in the industry for users of satellite transmissions. There is an industry consensus that counter-measures should utilize the addition of carrier identification to enable the quick location and correction of misconfigured or unauthorized carriers. DVB has accepted the topic of Carrier ID as a work item and that as a first step the commercial and market requirements will be captured within the Commercial Module and its relevant sub-group DVB-CM BSS. Once approved by the Commercial Module and Steering Board, such requirements will be passed to the Technical Module of DVB to review the various technical options from which a solution will be defined and selected that best meets the Commercial Requirements. For the transmission of transport stream live video over satellite, the addition of Carrier ID within the transport stream NIT table is considered one potential intermediate solution. Serge Van Herck, CEO of Newtec said: “Whilst an intermediate solution is necessary we need to look to the longer term. We welcome increasing industry-led momentum to find solutions to these threats. Newtec is very supportive of and active in industry-wide initiatives and efforts to counter and reduce the impact of carrier interference. One preferred longer term plan within the industry is a data-agnostic solution for identification of modulated video and data satellite carriers. Newtec has already begun talks with industry players and convinced leading satcom manufactures to join this initiative. It is also preparing an update of its current product range to implement this feature. There are a number of solutions in Newtec’s portfolio that already include interference counter-measures such as FlexACM®, and MENOS® with its automatic booking system to avoid manual errors (NIT support) which ensures a stable satellite link during interference.